After a few years’ break in my travels to the US, Boston was the first place I visited. It was my first purely tourist visit, not connected to any summer job in America and I spent more time there than in such tourist heavyweights as NYC or San Francisco. There were quite a few reasons for that. Firstly, it is one of the closest US destinations to Europe, just about 7 hours’ flight. Secondly, at the time of planning our trip it was also one of the cheapest places to fly to. Thirdly, established in 1630, Boston is one of the oldest cities in the US and I really like history. Finally, I was travelling with a person who was (and probably still is) positively fixated with all the things Irish and Boston is probably the most “Irish” city in America. So, because all of these random reasons I finally landed in Boston on a beautiful, sunny, September afternoon in 2007. It was a really glorious day so we quickly dropped our luggage at the hotel and went not to the city of Boston but to Cambridge instead, just across the river. Named after Cambridge in England, the city is home to two of the world’s most prominent universities, Harvard University and the Massachusetts Institute of Technology. The heart of the town and its busiest part is Harvard Square, located right next to the famous university. It is a great place to spend a relaxing and a slightly funky afternoon. The whole area is full of shops selling new and used books, nice coffee shops and eateries catering to a large local student population. We had a really good time browsing in bookshops and munching some delicious food. Of course being in Cambridge we couldn’t skip a visit to the Harvard University Campus, especially its oldest part, the beautiful Harvard Yard. It contains thirteen of Harvard College’s seventeen freshman dormitories, among them Massachusetts Hall, which, having been constructed in 1720, is the oldest surviving building on Harvard’s campus and one of the two oldest academic buildings in the United States. Also located in the Old Yard is a statue of the university’s first benefactor, John Harvard. This monument is a frequent target for pranks, hacks, and humorous decorations. Moreover, Harvard students urinate on the very foot that tourists rub for good luck. Be warned. The following day the weather changed completely. Off went the shorts and T-shirts, on went rain jackets and warm clothes. Somehow it always happens to me. On the day of arrival the weather is glorious but then it turns much worse. A couple of years later I had exactly the same experience in Minneapolis and then again in Chicago. Such is my luck. At least it wasn’t a complete washout so we bravely hit the streets of downtown Boston. 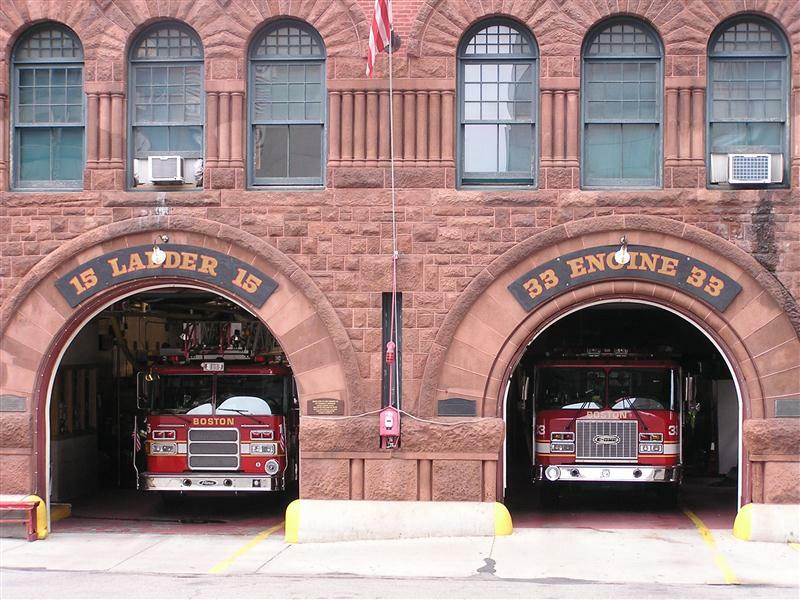 Boston is one of the oldest cities in the US and is the largest city in New England. This bustling metropolis offers an interesting mixture of old and new architecture. We started our tour from the Boston Common which is a lovely park, sort of Boston’s answer to Central Park in New York. It has, however, a much longer history as it started as a pasture in 1630 and it was also used as a camp by the British during the American War of Independence. All this long before Central Park was even created. Just north of the Common you can see the spectacular golden dome of Massachusetts Capitol. It really is covered with 23k gold. From the Common we headed towards the historic heart of Boston. There, in a relatively small area, you can find one of the most important sites in American history. One of them is the Old State House, built in years 1712-13, in front of which the Boston Massacre happened, an event which led a few years later to the War of Independence. Another historic building, not far away, is Faneuil Hall, which has been a marketplace and meeting hall since 1742. It was the site of several speeches by Samuel Adams, James Otis, and others encouraging independence from Great Britain. 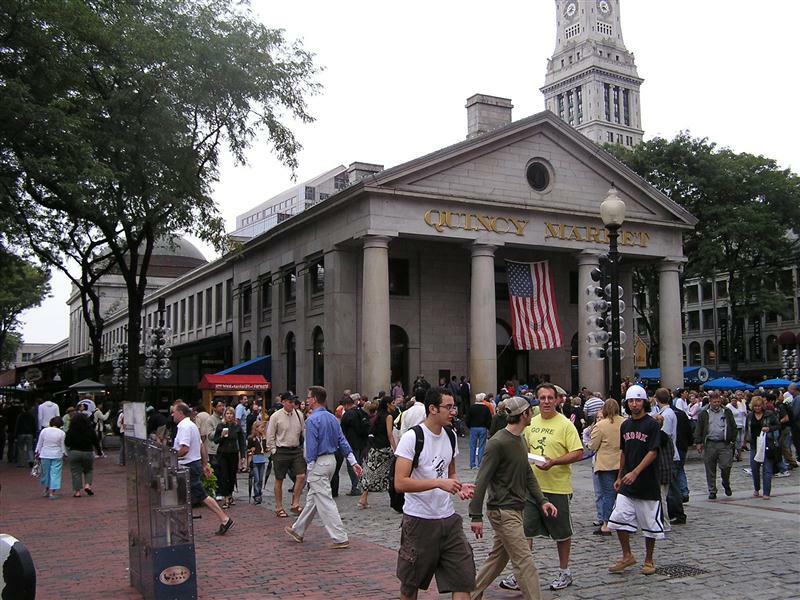 If all this history is too much (or if you don’t really give a damn in the first place) there is always the Quincy Market, located right next to Faneuil Hall. It was constructed in 1824-26 and is still going strong. Of course nowadays it is a touristy and gentrified sort of market, very similar to London’s Covent Garden, but still offering some great food. We spent quite a while there shopping for all sort of delicacies and gifts (a Red Sox baseball hat for example). From the market area we moved north towards the North End, one of the oldest residential communities in the country, a place where people have lived continuously since it was settled in the 1630s. Crossing a small urban park it is hard to imagine that not long ago to get there we would have had to walk under one of the worst urban highways in America, the infamous Central Artery (Interstate 93). A structure apparently so ugly that locals called it “the other Green Monster”. What is most amazing is the fact that this road wasn’t just removed, it was actually hidden underground and replaced on the surface by a 1.5-mile-long (2.4 km) series of parks and public spaces during one of the biggest engineering projects in the world. It really changed Boston for the better. The once isolated North End became integrated with the rest of city. As I mentioned before this small (just a third of a square mile ) and chaotic neighbourhood is one of the oldest parts of Boston. It is also Boston’s Little Italy with around a third of residents Italian. And it really feels that way, with all the Italian restaurants, and Italian flags painted even on the fire hydrants. Narrow streets and small buildings only reinforce the old world impression. It is a great place for stroll. And, of course, for good food as well. But for architecture my favourite neighbourhood in Boston is Back Bay. It is located just west of the Boston Common and is the total opposite of the North End. If the North End is chaotic, disorganized, spontaneous, even messy, then Back Bay is organized and stately. The reason for that is that it was built as a planned community in the second half of the 19th century. It was constructed on filled tidal land which was once literally a bay. The plan of Back Bay was greatly influenced by Haussmann’s renovation of Paris, with wide, parallel, tree-lined avenues unlike anything seen in other Boston neighbourhoods. Five east-west corridors are intersected at regular intervals by north-south cross streets. Restrictions written into the lot deeds of the newly filled Back Bay produced harmonious rows of dignified three- and four-story residential brownstones. Back Bay is listed on the National Register of Historic Places, and is considered one of the best-preserved examples of 19th-century urban architecture in the United States. All of its streets and avenues are tree-lined which gives the neighbourhood a patrician feel (and raises the property values as well), but none of them more so than the central axis of Back Bay, the Commonwealth Avenue, which is actually a parkway divided at the centre by a wide grassy mall dotted with statues and memorials. 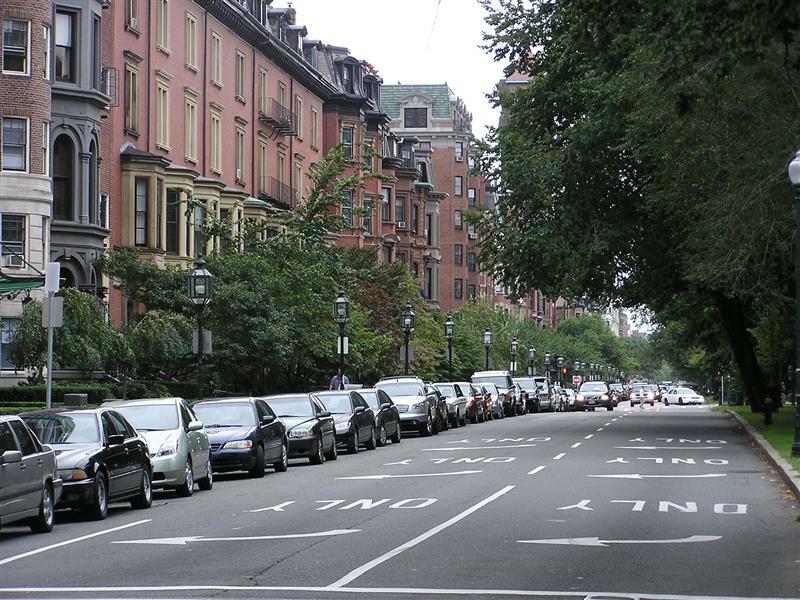 Today, along with neighbouring Beacon Hill, it is one of Boston’s most expensive residential neighbourhoods as well as a fashionable shopping destination. The best way of ending the day in Boston is to visit one of the many Irish bars which dot this city, (especially if your travel companion is all-things-Irish-crazy). We wanted to visit some pubs outside the downtown which were recommended in the guidebooks, but couldn’t find them. That way we ended up in some random local dive (the name of which I can’t remember) in the south part of Boston, in the area called Roxbury Crossing. The bar was narrow, dark and definitely oriented towards the locals. Food was good and they had plenty of good Irish and American beers. It was a fitting end to our visit in Boston. In general Boston has the feel of a prosperous and friendly city. It is also relatively compact and one of the most pedestrian-friendly cities in America. In other words the perfect place to ditch the car (or at least park it underground for most of the day) and switch to comfortable shoes instead. For me it is up there, together with Portland, as one of the best destinations in America for a relaxing short city break. It’s not as overwhelming as NYC, or too touristy like San Francisco, just perfect. This entry was posted in Uncategorized and tagged Back Bay, Big Dig, Boston, Boston Common, Cambridge, Faneuil Hall, Harvard, Massachusetts State House, MIT, North End, Old South Meeting House, Old State House, Old Yard, Quincy Market on July 26, 2012 by admin.